After it was featured in the popular film Top Gun, the F-14 Tomcat grew to international fame as one of the most recognizable fighter jets in American history. The F-14 Tomcat was designed during the Cold War to help defend carrier-based operations against Soviet-built MiG fighter jets and was capable of flying more than twice the speed of sound. The F-14’s advanced weapons system could track 24 hostiles and attack six targets simultaneously using the AIM-54 Phoenix missile. 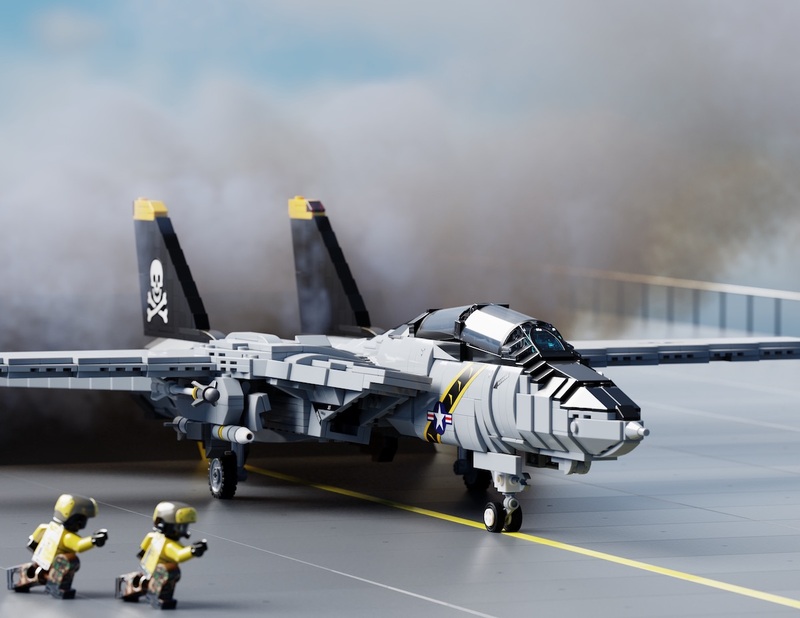 The Brickmania F-14 Tomcat is based on the real-life VF-103 “Jolly Rogers” color scheme. This model contains an enormous number of cool features including working landing gear, posable flaps and elevators, arrestor hook, and a fully-detailed cockpit. The model also features the iconic functioning F-14 Tomcat wings, two American pilot minifigures, several printed elements, and a high-quality sticker sheet. The kit also includes a display stand designed specifically for the Tomcat. Armed with two AIM-7 Sparrow and two AIM-9 Sidewinder missiles, your new Tomcat is ready for action! Kit includes alternative instructions for an all-gray build (pieces not included) that can be combined with the NAS Miramar Action Pack (BMF383). Upgrade your Tomcat with the AIM-54 Phoenix Missile Add-On Pack (BKM1034) for added realism!